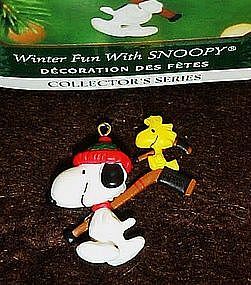 Adorable little Snoopy miniature ornament by Hallmark. This is #3 in the winter fun with snoopy series. Snoopy's good friend Woodstock is perched upon his hockey stick... a perfect place to scout for games, and Santa. Sculpted by Tracy Larsen. Excellent, and boxed. dated 2000.